A forest fire in a Jefferson County Open Space park in Colorado left many scorched trees. Expedited logging after forest fires may harm forests, according to nearly 170 scientists responding to efforts in the U.S. Congress to pass the Forest Emergency Recovery and Research Act. The issue of salvage logging was highlighted by a forum in Washington, D.C. this month, during which the impacts of logging in a forest following fires or other natural events were discussed, including the role these events play in maintaining wildlife and “healthy” forests. According to American Lands Alliance, nearly 190 million acres of federal land are at high risk for wildfire. Following the devastating forest fires in the summer of 2002, Congress passed the controversial 2003 Healthy Forests Restoration Act. The current legislation seeks to address rehabilitation after natural disasters. Most plants and animals have evolved with depend on and are adapted to periodic fires, according Dr. Reed Noss, professor of conservation biology for the University of Central Florida. Post-Wildfire Logging Hinders Regeneration and Increases Fire Risk – Daniel Donato et al. The effects of postfire salvage logging on aquatic ecosystems in the American West – J.R. Karr et al., 2004. Postfire management on forested public lands of the western United States – R.L. Beschta et al., 2004. Salvage harvesting policies after natural disturbance – D.B. Lindenmayer et al., 2004. Interior Columbia Basin Ecosystem Management Project. Recommendations of scientists representing the Forest Ecosystem Management Team that assembled the Northwest Forest Plan. The scientists also expressed economic concerns of postfire logging. According to a report cited in the letter, The facts and myths of post-fire management: a case study of the Biscuit fire, southwest Oregon (D.A. DellaSala, et. 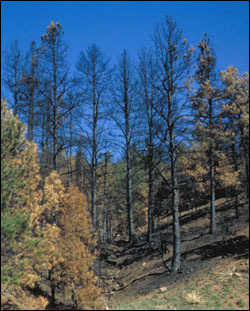 al, 2006), costs of postfire logging operations after the 2002 Biscuit fire in Oregon exceeded revenue by $14 million. Fifty-three million board feet of timber was removed. Sources: United Forests Defense Campaign, American Lands Alliance.